Welcome to the second installment in the series of PIC exclusive interviews! Our first interview focused on the background of a very interesting piece of software. Now we’re going to talk shop about hardware with a long-time user of not only the Palm OS but also of pretty much anything related to microelectronics and hardware/software engineering! Assisted by his multi-talented wife Veena, Gary Mayhak of Tech Center Labs is a technological Renaissance man in every way. Read on for a unique insight into what makes a small Palm-focused hardware company tick and to see how Gary’s lifetime of experience has led to the development of a series of modules designed to address specific needs and shortcomings in Palm's products. Kris Keilhack: Give us a little introduction to Tech Center Labs/Tale Stuff. What is your background (I imagine this might be a loaded question, given that you've hands-on familiarity with stuff from the 1960's!) and how did the company come about? Also, how did you manage to end up being involved with the Palm OS handheld world? Gary Mayhak: I was introduced to electronics in the 1960's, graduated 'top of my class' in the Navy A and C schools and served on the Boxer and Yellowstone as an ET maintaining the new URC32 transceivers. I also married my wife Veena (we celebrated our 40th anniversary this year!) in 1966 and took my first and only company job with Ampex in Redwood City in the late 60's. While there I was working to improve reliability of the head/disc interface on the HS-100 slow motion / instant replay machine (http://history.sandiego.edu/gen/recording/television8.html ) and Videofile (used by Scotland Yard for the electronic storage and retrieval of fingerprints). The semiconductor industry was really taking off and there was no reliable way to measure line width of the traces on masks and wafers. Working at home in the evenings I added electronics to the PET that would digitize video from a camera mounted on a high power microscope and developed software to threshold the digitized image and calculate line width. The product was marketed by McBain Instruments as the Micro Measure. I believe it was the first use of computers for this application. I formed Calco Digital Equipment and later built a similar system with the newly introduced IBM personal computer. In the mid 80's we moved to Scottsdale and set up in the new Technology Center at the airpark, hence Tech Center Labs. I designed and manufactured six-axis quadrature decoder boards and AutoFocus electronics for Ram Optical Instrumentation for several years. In '87 I designed a little system that stored analog video images on a 20 meg hard drive (state of the art IBM) There was an article about it in the Innovations section of the February 1987 High Technology magazine (a patent was issued in 1989). During the ‘90's I became interested in neural networks and designed an "Owner Loyal" firearm. When Casio introduced the Cassiopeia it had a neat little bar on the case that would light up to get your attention. I thought that would be a cool feature for my Palm Pilot so I designed a device that served dual purposes; it would protect the hotsync port and could also light up under software control. Thanks to Julie's review it became a huge success. We machined the TaleLight on my little CNC Shirline mill and the (small at that time) Palm software development community started writing software to control it. Q - Why the dual nomenclature (TaleStuff/Tech Center Labs)? A - Well, next I decided a vibrating alarm would be a neat addition to the Palm Pilot so I designed the TaleVibes and later, the RumbleCard springboard module for Prism. Palm accessories were becoming quite a side business so I use TaleStuff as my consumer business for Palm users but I still do industrial work as Tech Center Labs. A few years ago Palm inc. became a sponsor of the PGA TOUR, the tour was developing a computerized data gathering system in conjunction with IBM called ShotLink. It also feeds their new TourCast On Line. The Shotlink system relies on hundreds of Palm i705s carried by 'walking scorers' that relay data to the scoreboard trailer through a belt-mounted transmitter. They needed a way to get data from the i705 to the transmitter and to keep the i705s charged. I was able provided those products and did so gladly. Q - Most of your recent products focus on the Palm TX. Do you consider that device the paradigm of Palm PDA design or is it just that its wi-fi make it a great VOIP platform? A - Both. The TX is a very cool Palm. I think it, like the V/Vx, will have a long life. Q - Does a product that just indicates TX compatibility on your website work at all on the T5 and the T|E series? I'm referring to the Concert Lights projector. A - I'm not sure, I only have the TX so that's all they are tested on. Concert Lights was mostly just a personal challenge to see if it could be done. I will probably remove it from the Catalog because they are hand built and very time consuming. Q - How are you able to have a perfectly functional microphone connected via the Athena/Multi Connector without the need for drivers? Is there some kind of rudimentary audio capture API built into Garnet? Q - Do you do any software coding personally? If so, what developer tools do you use to code for Palm OS? A - I've written about 20 little apps for Palms and most of them are free. One of my favorites is NanoBots. I use Orbforms Designer, it's very powerful and a joy to work with! Q - Many of your products seem to be concentrated in a particular "era" of handheld devices. For example there are a lot of microphone products for the Palm TX, a lot of power/charging products for only a few of the Multi Connector Palm devices but all of the Universal Connector devices, then your IR blasters for OS 4 and 3 products. Why is this? A - I had slowed down considerably on the Palm accessories because of my work for the PGA but one of my past customers asked if I would make a microphone for his TX. I made him one and added it to the TaleStuff Catalog. There was a lot of interest in the mic and the PIC review really helped. At first I used a cable connector as the enclosure for the mic but wasn't happy with the size so I now machine the smaller connector portion and mount the mic in it. This is what TX users were waiting for. The tiny bud-mic is a very popular item. Regarding the IR Blasters, Palm OS 5 isn't supported for external infrared. Speaking of using your Palm as a universal remote control it wasn't always so easy. I designed the 'Wedge' for the Pilot and P3 back in the late 80's. Q - Do you do all of the conceptualizing, design, engineering, and troubleshooting work yourself or do you have an engineer(s) you work with? Q - Your microphone cradle looks especially intriguing! This is a "bigger" (in both size & price) than most of your other products. Is this a hint of things to come? A - Many of my products are just 'value added'. My "Insten" cradle had an annoying LED in front of the hot sync button, I replaced it with a microphone.... worked cool so I added it to the Catalog. Q - Do you work closely with companies like Motion Apps and Toysoft to ensure optimum compatibility and operation with their apps? I love the fact that you list all of those cool sound recorder and VOIP apps on your catalog page! A - Once I had the mic I started checking out voice apps and found some had problems with the TX, all the developers I worked with were very responsive. Thanks for the compliment. It took some time locating those neat programs so I wanted to make it easier for my customers. Oh, if you play guitar or have a friend that does you might want to check out 'Perfect Pitch'. It's basically a real-time spectrum analyzer that automatically displays notes and frequency. It’s a cool piece of software that's been around a while but not been reviewed as far as I know of--works great with our mics too! Q - Have you ever consulted or worked in conjunction with any companies who are deploying TXs on a wide-scale basis as hybrid PDAs/barcode scanners/VOIP walkie-talkies, for example? A - For earlier Palms I designed and manufactured the original hardware for Tescina ( http://www.dataget.com/ ) and work closely with the PGA TOUR for their requirements. There is a possible TX application in the works overseas but it's still in the early stages. Q - Have you ever been approached for any collaborate work or whatnot by one of the "biggie" peripheral manufacturers (Belkin, Seidio, Brando etc) or Palm themselves? 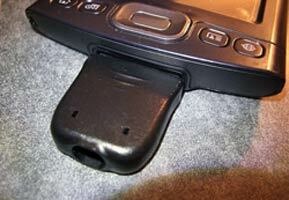 A - When the Palm V was introduced I designed a little 9 volt charger for it and coined the term "Emergency Charger". One of the biggies wanted to purchase this 'technology' but ended up just copying it. Hopefully someone “major” will take notice of us again and actually follow through with their plans! Q - Why do you think Palm omitted an integrated microphone from the TX? Were they worried it would steal the thunder from the Treo line or was it purely a silly cost-cutting measure? A - I can only guess that they were only aware of their limited use 'Voice Memo' and not all the other great third party applications that require a mic. Q - If you were put in charge as product planner for a new TX2 style device at Palm, what would you attempt to do with the unit, given the limitations of the OS and Palm's current stable of technology? A - Personally, I stayed with my Tungsten T for a long time and the TX already has more capability than I can foresee ever needing. I'd like to see the mic and a vibrating alarm housed internally. Also, I’d like to see titanium used instead of plastic for the case. And of course, more stability of the OS; now my TX is discharging during the night and I don't have a clue why. I'd love to see more diagnostic software so problems like this can be tracked down. A - There is a huge Palm software development community that is going to dwindle away if they keep requiring new development tools. The full power of the present OS is being tapped by very few (if any) applications. Two years from now I hope Palm remembered that many of us use land lines and the internet for communicating and like having a PDA with large screen for all our other 'stuff'. If Palms are still around I'll probably still be making gadgets for them. One thing I really want to see on a Palm in my lifetime is an implementation of Jeff Hawkins' Hierarchical Temporal Memory. I think it could be done to some extent and would be a great tribute to our 'founder'. I've left out a lot but if anyone wants more ( yeah, right ;) it can be found by goggling "Tech Center Labs" Palm (about 20,000 links). I want to thank everyone that has tried our products over the years, some of you have been with us since the early Palm Pilot days! Thanks Kris, I enjoyed activating those dormant neurons. Thanks Kris & Ryan for posting the review and the 'glowing' introduction! I'm wondering if anyone has had to replace their TX battery? I've tried removing all software and the SD card, turned off beam receive, bluetooth & Wi-Fi. Still looses about 30% of the battery overnight. I don't have warranty on it so I've ordered a replacement battery and hope it's not the electronics. I assume that means you did a hard reset, right? If not, that would be one more "investigative" step to take. Right, I did a hard reset but thanks for the suggestion. When my replacement battery arrives (I ordered the 1400 MAh one on ebay) I'll see if this one discharges when it's disconnected from the TX, don't want to do it yet because I need to keep the TX alive to test microphones. I'm trying a LifeDrive next. I've read all the complaints but can't pass up that much technology for a couple hundred bucks. I'm really impressed by the tiny 4GB drive, probably because of the years I spent with Ampex pioneering hard disks and developing methods and tools to coax the recording heads to fly on an air bearing a few millionths of an inch above the disk surface without crashing and wiping out everything!